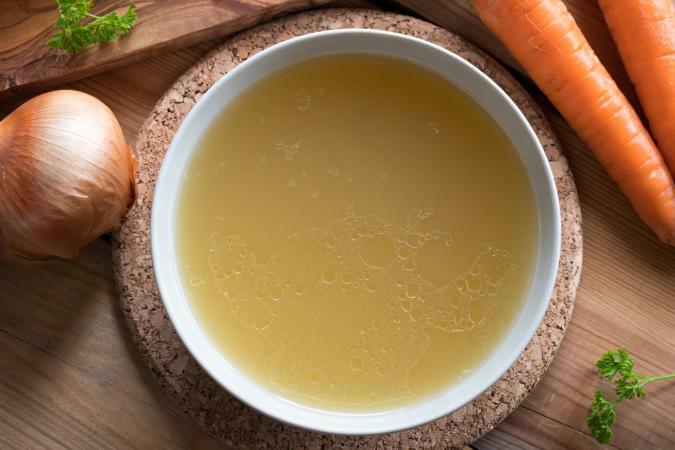 Some health professionals report bone broth offers numerous health benefits and as a result, its popularity has soared. However, perhaps the best benefit of bone broth is its flavor. It has a delicious, meaty flavor that serves as an excellent base for soups and stews, and it's easy to make. To make bone broth, you need bones from meat, game, or poultry and plenty of time. While the much of the time you spend is passive (you don't have to do anything other than make sure you don't catch your kitchen on fire), you'll need to be in the vicinity as a safety precaution while it simmers; never leave unattended pots on the stovetop. Longer cooking times result in a more deeply flavored broth and in general, the recommended cooking times is about 12 to 14 hours. Using a slow cooker makes the process slightly easier and requires less attention. In a large stock pot, combine all of the ingredients. Bring to a simmer on medium-high heat. Reduce the heat to low and simmer for 12 hours for poultry and about 15 hours for beef, game, lamb, or pork. Strain the solids and discard them. Refrigerate the broth overnight. Skim the solid fat from the top and discard it. Store the broth in one-cup servings in the freezer for up to 12 months or in the fridge for up to five days. You can pre-roast uncooked bones to deepen flavors. To do this, drizzle the bones with olive oil and put them in a roasting pan. Roast in a 450 degrees Fahrenheit oven for 45 minutes before adding them to the stock. There's no need to peel vegetables used in the broth. Just wash them and remove any produce stickers, and then cut them roughly (chop carrots into three or four pieces, for example). Onion and garlic skins are fine. Up to 8 ounces of mushrooms make a nice addition that adds earthy flavors. One method some cooks use is to save vegetable and herb trimmings and peelings in a zipper bag in the freezer from other recipes, using those in the broth in place of the vegetables. Vegetables appropriate for this include onion and garlic skins and peels, carrot peels, herb stems, tops from celery, carrot peelings, mushroom trimmings, and trimmings from fennel. When you have two-gallons of trimmings, you can replace the vegetables in the bone broth. This saves money and reduces waste. Avoid using strongly flavored veggies, such as artichokes, asparagus, greens, and bell peppers, which may impart strong or bitter flavors. You can use leftover carcasses from roasted chicken, bones from cooked steaks or roasts, and other leftover bones, as well. You can also combine types of bones or use raw bones you buy specifically for the purpose of making the broth. Good beef bones to use include oxtails, knuckles, and marrow bones. You may be able to use beef bones more than once. If after you strain them the bones are still intact (they haven't begun to break down), rinse and freeze them for your next batch and use in combination with new, fresh bones. Along with using carcasses from cooked poultry, you can use cheap, bony poultry cuts with the meat still on them, such as wings, backs, or necks. Many people like to drink a cup of the hot broth first thing in the morning, but it also serves as a great base for soups and stews. Use as you would any other broth.